Everyone lives their lives trying to not be boring. They don’t want to live like everyone else. They don’t want to seem average. People prove they’re not boring by buying nice houses, interesting cars, fashionable clothes. “I couldn’t possibly be boring. Just LOOK at me!” In this cycle of trying to prove we’re not boring, we also expect boring answers to be wrong. People want shortcuts. They want to hear the anecdotes and not the research. Everyone wants to be in shape and everyone wants to be rich. Why do you think the weight loss and financial industries are so large? We want a pill or a get-rich scheme. Do you know how to get in shape? You exercise. You actually work the muscles you want to be strong. Do you know how to get rich? You save money. You let money grow by not touching it. Drive “Practical but Unexciting” Cars – Fund managers who drive sports cars take on more risk… but the risk doesn’t translate into better returns. So, make sure you’re checking the parking lot before choosing your fund manager! Are from Poorer Backgrounds – It turns out privilege puts people in positions they don’t necessarily deserve to be in. Fund managers from poorer backgrounds may have to prove themselves more because of their lack of connections or status, so the ones that make it are smarter and have more grit than the ones that got a “leg up” to get there. *This is similar to the “Costco Effect” in Anchorage. We’re told to be grateful we live in Anchorage after Costco came because before that, prices were much, much higher. **I can’t claim I don’t have the privilege card, because I do. We are not better than you. And you are not worse. How Easy is it to Save a Million Dollars? Do you know what my favorite posts to read are? The ones about how saving a million dollars is totally easy! And guess what? There are THOUSANDS of articles about how easy it is to become a millionaire! I decided to aggregate a few of my favorites to drive the point home. Saving a million dollars over a long period of time is actually very simple! Interest rates matter quite a bit when it comes to saving money. 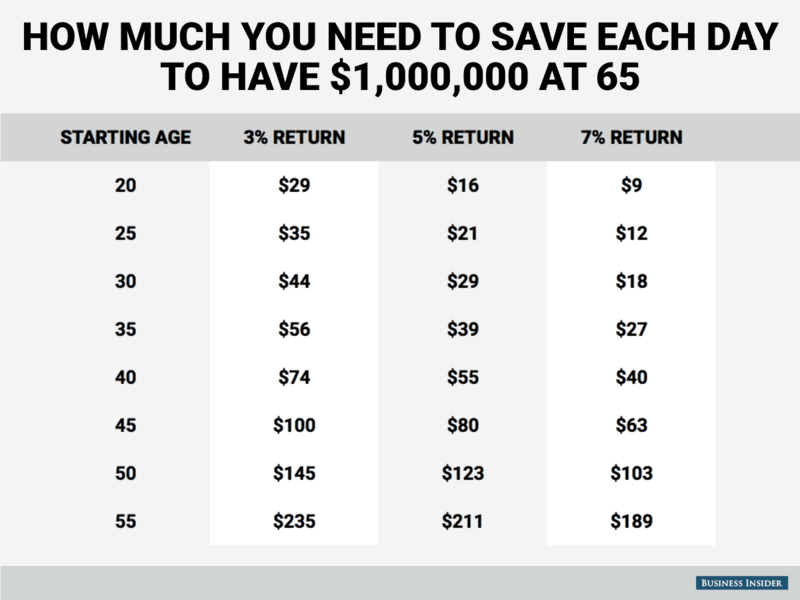 This Business Insider chart gives you a daily savings need based on 3 different return rates to save $1,000,000 by 65! Are You a Saver or a Spender? The Why. Penny: McKinley is a saver. I’m a spender. Me: What makes McKinley a saver and you a spender? Penny: McKinley just saves all of his money. I buy things. Like my waterproof camera. Well, I guess I’m more of a saver, then a spender. Me: What’s the point of McKinley saving his money? What is he going to do with it? Penny: I don’t know. He just keeps it. Me: Dad and I are savers. But do you know why we save money? Penny: So we can go on vacations and dad doesn’t have to work until he’s old. Me: Right. Money isn’t worth anything if it doesn’t have a purpose.